Reducing usage and waste of toilet roll and hand towels in industrial environments. A glass manufacturing company have reduced consumption and indirect procurement costs by using Tork® toilet paper and hand towels at both of their sites. Encirc manufacture glass containers for the Food and Beverage industries. With a large number of employees at their sites, they need efficient hygiene systems to cater for high traffic. At the sites they were having issues with waste and blocked drains due to over-usage of toilet tissue and hand towels so Tork offered a solution to overcome this by introducing new systems. 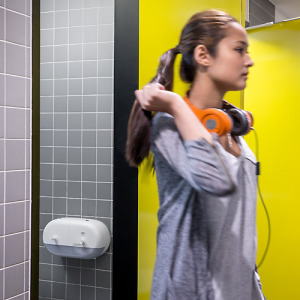 Tork SmartOne® toilet roll and Tork Matic® hand towel dispensers were introduced at their site in Chester. Previously they used folded toilet paper but multiple sheets would come out of the dispenser at once meaning employees used more. In turn, causing blocked toilets and drains and an additional cost to unblock them. Another issue is that they would run out quickly, therefore need to be refilled more often. Encirc installed Tork SmartOne toilet roll dispensers to prevent these issues. In addition to introducing SmartOne toilet roll dispensers, Encirc also installed the Tork Matic Hand Towel system which has seen similar benefits with the usage of hand towels being “drastically reduced”, as described by Matt. Previously, employees would pull out a lot of the roll causing excessive waste however with the new dispensers, they just take one and the quality is better so less towels are needed to be used. SmartOne offers a cost effective, hygienic and reliable solution in both single and twin dispenser form and Tork Matic delivers a high capacity solution – both with one-at-a-time dispensing, reducing consumption and waste. Tork SmartOne® dispensers are more aesthetically pleasing and employees prefer the feel and the quality of the tissue.